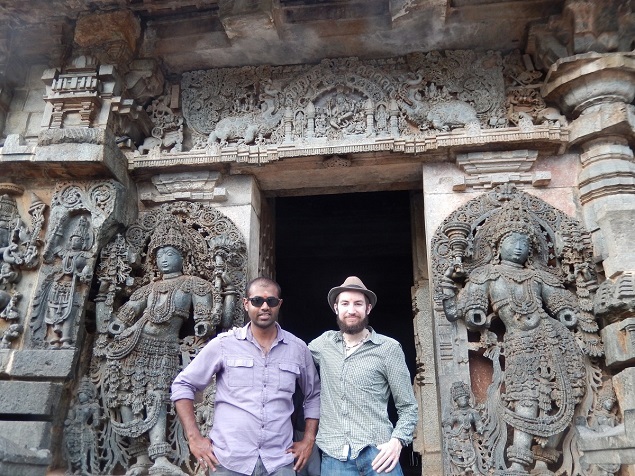 Benjamin Mack and his friend Kesi at the Hoysaleswara Temple. Photo Credit: Benjamin Mack/GALO Magazine. We were not alone in the temple. Slivers of golden light filtered through the latticed walls, highlighting that the air was choked with dust. While the powdery soot itself was surprising, given how popular Hoysaleswara Temple is among pilgrims whose regular barefoot traffic has worn its rocky foundation smooth in the same way sandpaper does wood, the flickering of candles enabled us to make out the innumerable soapstone carvings and sculptures, which were accompanied by Kannada script lining the frieze-covered enclosure. Rumors about the temple abound. Some locals claim the place is haunted, while others swear it was once booby-trapped. Even its origins are shrouded in mystery: according to one legend, a young woman thought she could dance better than the Hindu gods themselves, and a competition was held to see who was best. She ended up losing to Shiva, who, as punishment, trapped her spirit inside Hoysaleswara. As the legend goes, she has been desperately trying to escape to exact her revenge ever since. We were yet to encounter any vengeful spirits from beyond the grave in the temple’s shadowy world of narrow passageways, high ceilings and oversized columns, thankfully, and the temple was not jammed shoulder-to-shoulder with hordes of tourists as one might find at the Taj Mahal, which presented us with the opportunity to really take in our surroundings with blatant admiration. To get to this point, however, my friend Arun, former Berlin flatmate Kesi, and I had endured a more than three-hour drive covering over 200 kilometers in a cramped bus that had begun before dawn. Perhaps the journey wasn’t all bad. The bus did have air conditioning at least. And at 2,400 rupees ($38.52; 35.64 euros) per person, we were able to experience some of the most spectacular temples and cultural sites in southern India, courtesy of a daylong trek to the history-steeped town of Halebidu organized by the Karnataka State Tourism Development Corporation (KSTDC). Yes, travel agencies still exist, at least in some parts of the world. It may have been late December, but temperatures were hovering around 30 degrees Celsius (86 degrees Fahrenheit), with enough moisture in the air to make a person break out in a sweat within seconds. Mosquitoes constantly buzzed about, a blood-sucking insect maelstrom impossible to completely defeat even with long-sleeved clothing, a brimmed hat, and constant swatting that left bruises all over. After departing from Bangalore (officially known as Bengaluru) — where Kesi and I had been staying the past few days with some friends — before dawn, we had found ourselves at Shravanabelagola. Located near the town of Channarayapatna, Shravanabelagola sits atop a solitary hill that offers an unparalleled view of the surrounding countryside. About 2,000 years old, the temple is known as one of the “Seven Wonders of India” thanks to the presence of a 57-foot (17-meter) tall (and very anatomically correct) statue of Bahubali — one of the most important figures in the Jain religion, and the largest monolithic statue in the world. Reaching the statue is a relatively simple matter, provided a visitor is able to ascend the 614 steps cut directly into the side of the mountain. The sun was almost directly on us as we rose past gaggles of wild monkeys slinking about above the roofs of the bungalows, huts, and other structures of the village below us. The blazing brightness baked the rocks and lent everything a whitewashed appearance, but still we pressed on, going higher and higher as rivulets of sweat slid off our glistening backs. Our toils would prove well worth it: the main citadel of Shravanabelagola was nothing short of stunning. Stone predominates at Shravanabelagola, into which are carved more than 800 inscriptions dating from about 600 AD to 1830. Pilgrims on the journey of a lifetime milled around and paid homage to the towering Bahubali statue, while monks in crimson, orange and white robes flitted about in shadowy verandas and nearly pitch-black passageways. The air, which perhaps due to us being about 3,280 feet (1,000 meters) high, had a slight alpine tinge to it, but it also carried the strong scent of rich incense and spices whose names I couldn’t even begin to guess at. Was it jasmine, or maybe chamomile? I’d have known were I a better cook. Time was at a clichéd standstill as we explored the temple grounds and took in the commanding view of the palm tree-slathered jungle below. Despite the healthy amount of people all about, it was almost completely silent but for the whistling of the wind, the speed of which made me wish I’d brought a jacket. I changed my mind about the jacket as soon as we’d descended from the mountain. Air stickier than taffy, the ceaseless buzzing of insects made me sympathize with those who suffer from the constant ringing caused by tinnitus. Rather than protecting us from the sun, our shirts were serving more as rags to soak up our prodigious amounts of sweat. Yuck. A snack of coconut helped to stave off the headaches I was experiencing that indicated dehydration. The food helped a bit, as did sitting back on the bus immediately afterward. Occupying seats 20, 21 and 22 near the back of the bus, the breeze from the open windows facilitated in keeping things somewhat cooler as we barreled toward our next destination: lunch. As this was an organized tour, we had a lunch at a restaurant the tour company had made reservations with in advance. The restaurant was a low building just off the main drag in a village whose name was unknown to me. Inside, it was spartan at best: simple folded tables with chairs served as eating areas for diners, while a white linoleum floor — with more than a few scuff marks — complemented the white walls. ← You Asked, The Jar Family Answered!